I have just returned from, possibly, the best trip of my life – so far. I’ve spent the last 20 days visiting several cities in Bolivia, northern Chile and Argentina, but Buenos Aires stole the prize. I could talk for hours about the beauty of the architecture, the rich history or even the relevance of their past to the Argentine’s every day life, but that would require several posts. Instead, let me show you an insight to all these things found in one art form: Street Art. 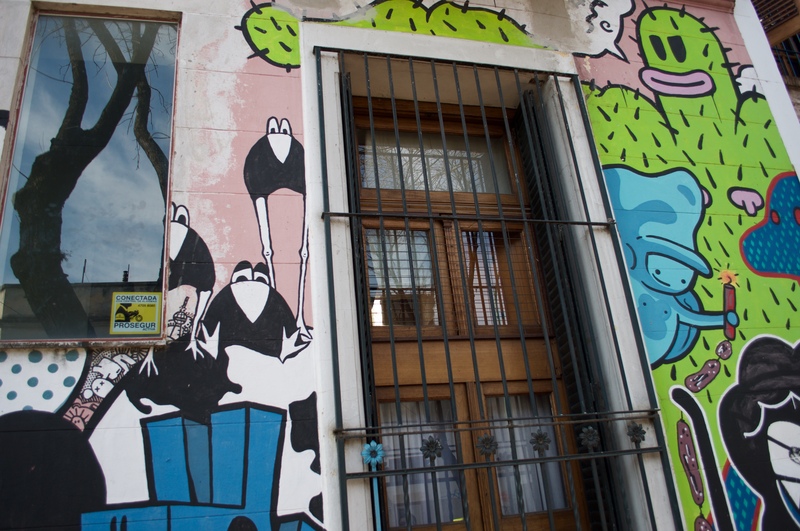 A highly recommended tour led me to Graffitimundo to explore the north of Buenos Aires’ street art scene. 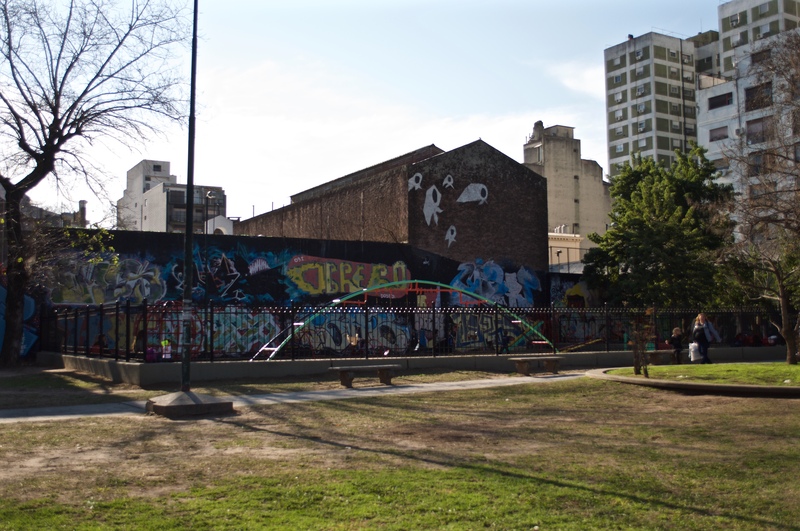 If you want to know the whole shebang, book a trip to Buenos Aires and get on it, otherwise, have a read of what I discovered. 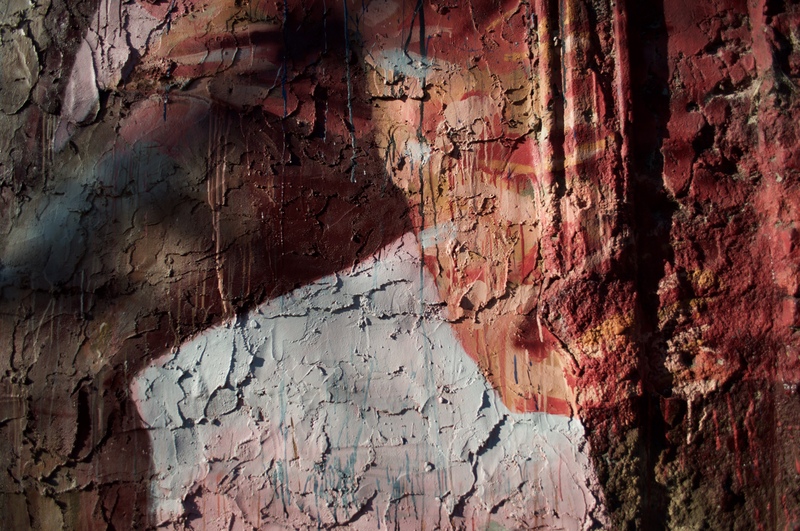 ‘Graffiti’ tends to have negative connotations often related to rebellious behaviour and vandalism, but more often than not, it is an expression of the current social, political and economic situation of a place. Like so many countries in South America, Argentina fell under a cruel dictatorship that only ended in the 80s. The streets were used for both political and anti political slogans and propaganda. 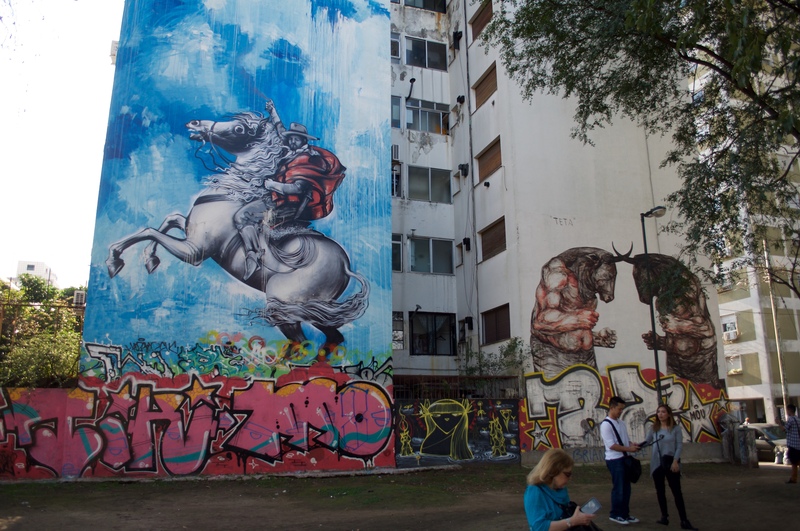 At the height of this, walking down the streets of Buenos Aires only fuelled anger, frustration and sadness so street art served as a means of social change. Other influences included the end of the dictatorship allowing people to travel and be inspired by other countries’ art. Now that you have the tiniest dose of history, let’s throw this into context. Unfortunately, I don’t remember all the names of the artists including this first one. The story of his house and his wall was, that in this time of strife, he invited his friends over for an asado (BBQ) and they decided, quite spontaneously, to paint the walls of his house. Why? For something positive, something fun, something different. So that someone strolling past his house could let a smile creep onto their face. The respect amongst other artists is seen here, there are barely any tags or new pieces placed over the original wall. OK, so you might think we’ve got some guys doodling crazy cacti on a wall for a bit of positivity in an era of turmoil. If you can’t see the relevance in that, take a look at this anonymous piece. In street art, context is key. What you see here is a symbol of the Mothers’ of the Missing – a white scarf, often the swaddling clothes used for a baby, wrapped around a faceless head. The ghostly icon keeps watch over a playground where children are still running, laughing and playing. Tiny dose of history 2: During the dictatorship, kidnappings of ‘political opponents’ occurred. This escalated to a point where innocent people off the streets were taken, tortured and killed. If a girl was pregnant or had a child, they simply took the child and gave it to a right-wing family and the birth mother, more often than not, was murdered. The Mothers’ and, because of the babies, Grandmothers’ of the Missing started to protest. At the time, gatherings of 3 people was seen as suspicious activity, so these women wrapped white scarves around their heads and walked in pairs, in silence around the independence monument in front of the Casa Rosada (the Pink Palace). To this day, they still silently protest at around 3pm every Thursday to find their missing grandchildren. Last year, the head grandmother of this intricate organisation, was reunited with her grandchild. Starting to get it? 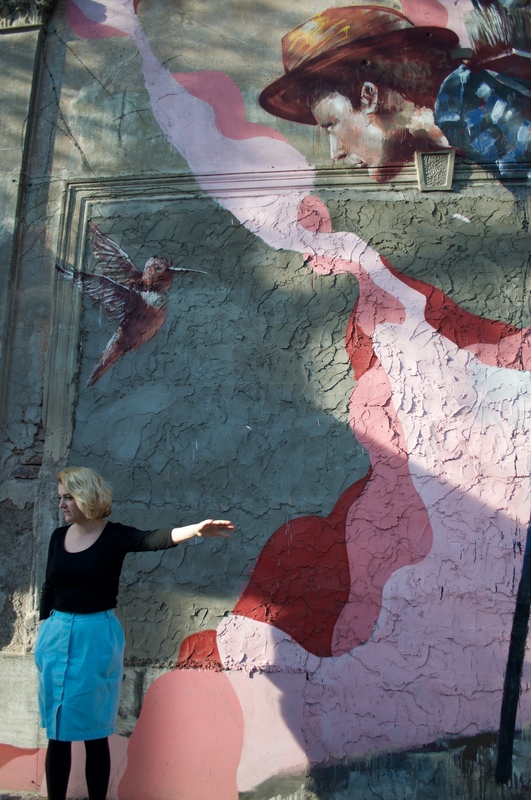 Mothers’ of the Missing symbol (history) + Playground (context) = powerful street art. Not really just a scribble anymore is it? Jaz, my favourite artist we saw on the tour, covers very modern themes where he symbolises the ‘urban tribes’ he is targeting with clothes, jewellery or tattoos, but then masks them with animal heads. More often than not, his characters are vicious and violent portraying duality and reference to both local and pop culture. On this wall, he is focussing on the football hooligans which, apparently, are almost an equivalent to the mafia in Buenos Aires. The wife beater vests and tattoos is what gives their identity away. Tattoo: 5 dots. If they are arrested, this violent group gets a tattoo of this symbol. It portrays the one that crossed them (often a policeman) in the middle and 4 of their group surrounding them signifying a definite revenge. The bulls are also by Jaz. A mural in memory of two teenagers that were killed was painted over for a street art festival. Jaz, as a local, understood the importance of this mural. He painted two bulls in an experimental mix of gasoline, latex paint (the most common material used in street art here) and tar. 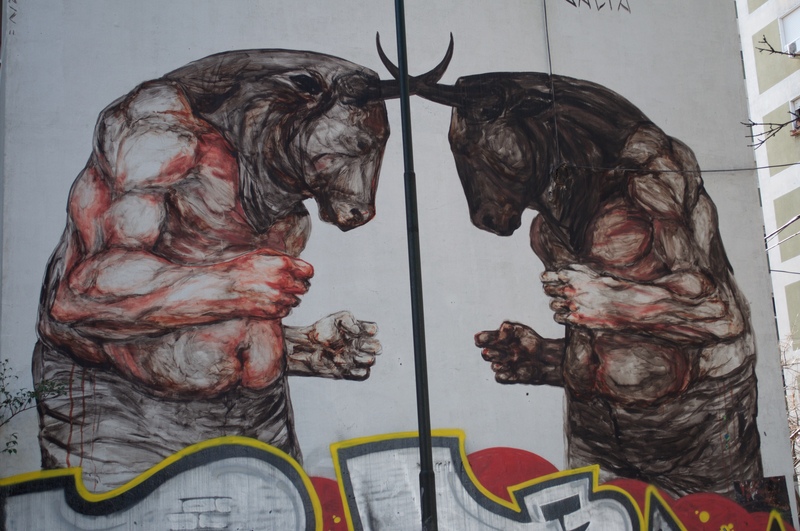 Above the bulls are the nicknames of the two boys that were killed: ‘Teta’ and ‘Salta’. The piece, due to both its scale and importance, is left mostly intact due to its dedication and poignancy. Magee, an Australian artist, tackles an issue about the meaning of home. This building was once used by squatters. In time, the squatters were sent out and the building was sealed up so that it could be demolished for future constructions. 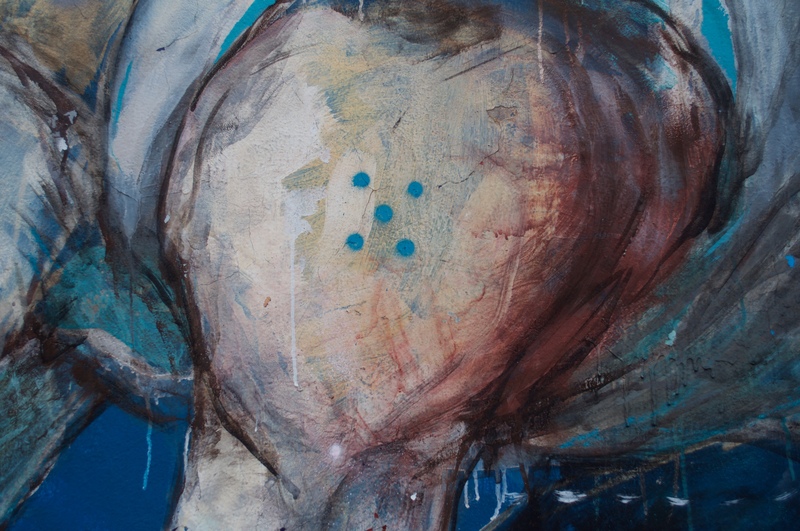 Magee depicts a man travelling with his home on his back emphasising the theme of transience. This piece is stunning and Magee cleverly uses the textures of the building and creates extra ones through the use of dripping paint. 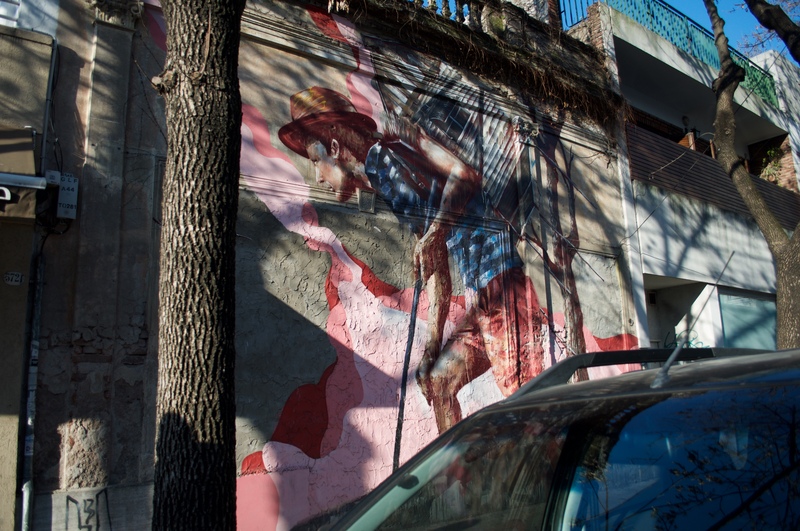 It feels like you are with the traveller as Magee adds details such as a tree that reflects the one on the street and his muted colours only make the mural stand out even more. The last artist I’m going to cover is Cabaio. He is a commercial street artist. Compared to the others we’ve discussed, he is a different kettle of fish so to speak. Let me explain. 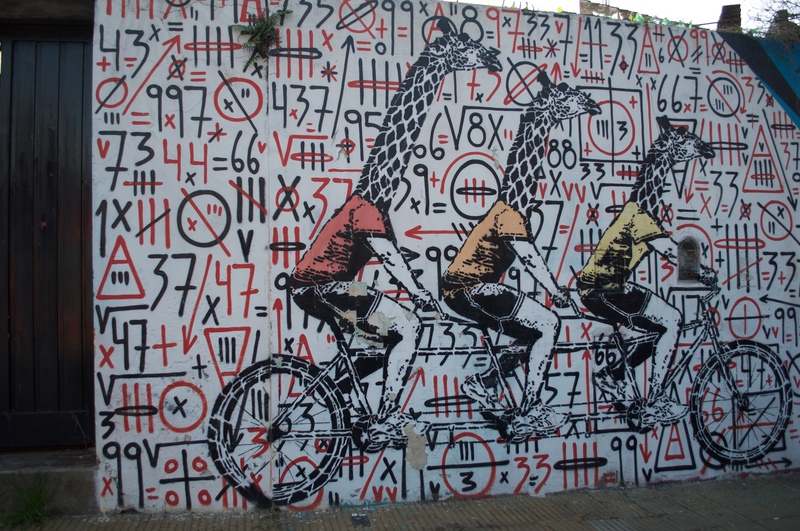 Many shops, studios and offices do not want tags covering their walls so, they ask street artists to paint them. 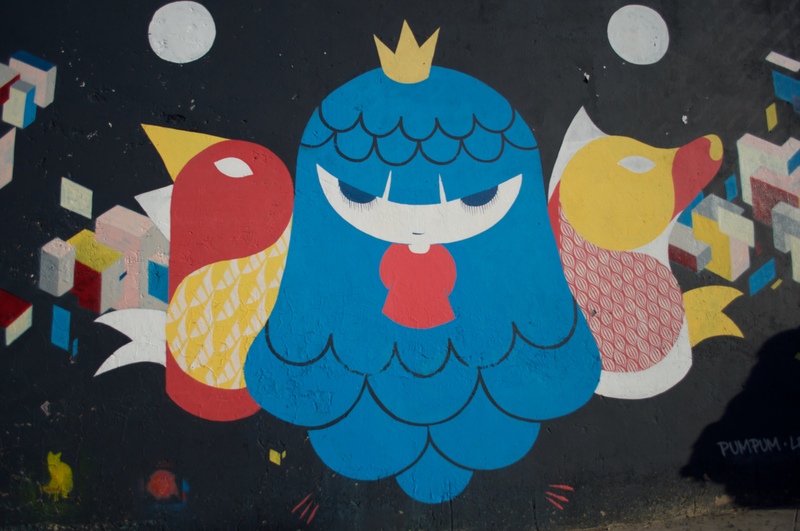 Cabaio has a stand out, vibrant style and normally works in layers. First layer is for colour background, second for texture and pattern, third for stand alone pieces on top of the composition. The perfect example, of this is at Fukuro, a ramen noodle bar (if you happen to pop by, I recommend eating their too). He used imagery from China, Korea and Japan (I believe) to create a wacky shop front for this fusion restaurant. The inside is just as awesome. 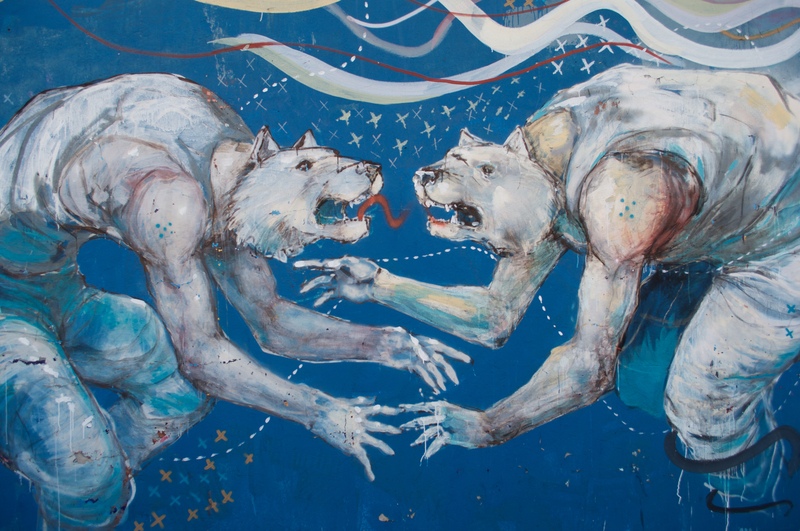 When it comes to commissioning street artists, money isn’t always the way. Often shops will supply them with the materials they need or the artists expect something from the shop (ie food, clothes etc). Fair trade in my books! 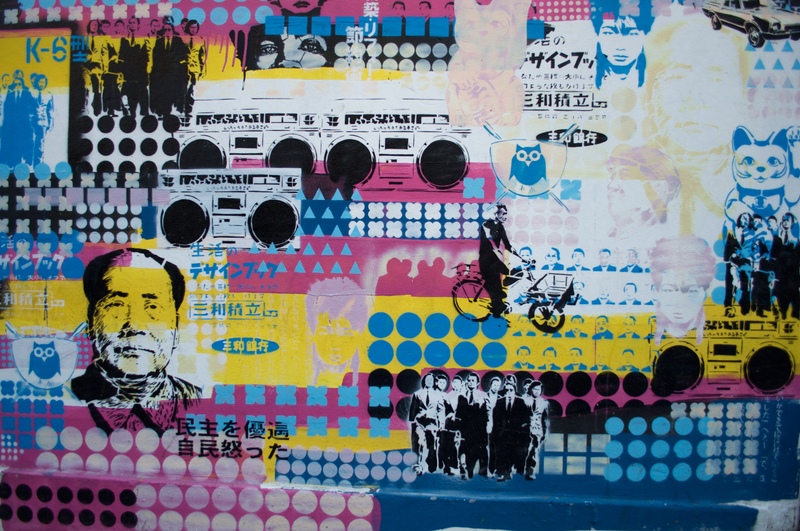 These are only a couple of the artists and pieces we covered on the tour so I suggest you take a look at Pum Pum (one of the most iconic female street artists), Gualicho and Mart as just a few little extras. 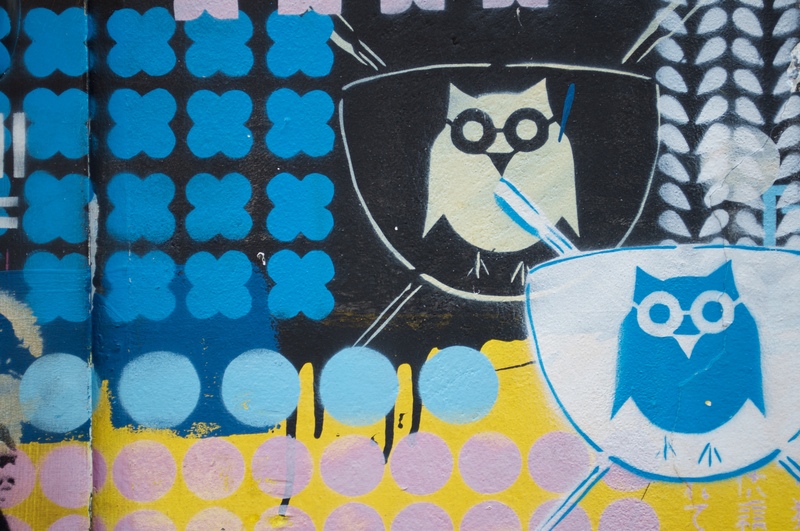 This tour highlights several important points and educates the non street art savvy. Street art isn’t just paintings on walls, it’s constructions, DIY solutions (mostly influenced by the skater community), it is collaboration amongst artists, it is both social expression and social change. Street art has so many meanings other than just it’s aesthetic face value. Whether you are tagging, bombing or painting full murals, there is a code to your art that so many people choose to ignore or frown upon. Now, I’m not a tagging fan, and bombing can be interesting to an extent, but like any expression, it is often a misunderstanding that stands as a barrier to appreciation. I ask you to try and understand the importance and tear down your barriers. Listen up! 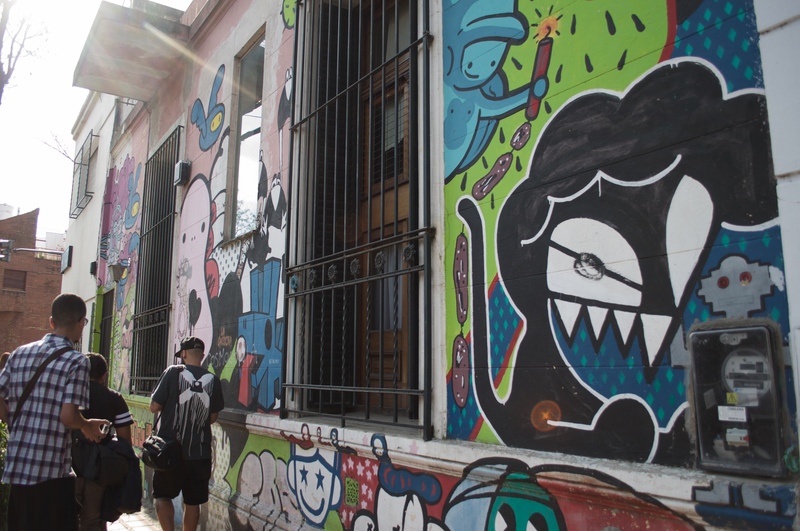 If you’re cruising through Buenos Aires and you don’t have money for a tour, then save some money for a drink at the Post Street Bar where you can have a beer with the local street artists and appreciate their work from inside the bar walls! 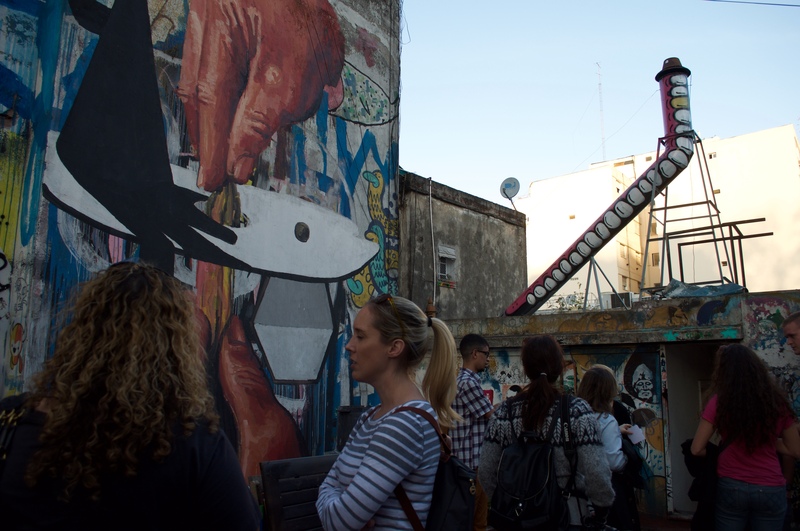 Huge thank you to Valeria – the awesome experience officer in training on my G Adventures tour – for convincing me to go and, of course, Graffitimundo for a real eye opening and educational tour! Thank you very much! That means the world to me. I fell in love with the city too and am seriously contemplating on moving there!